One of the great things about Pinterest is it is so visual. One of the tough things is it's so visual. It helps to create images that will stand out. 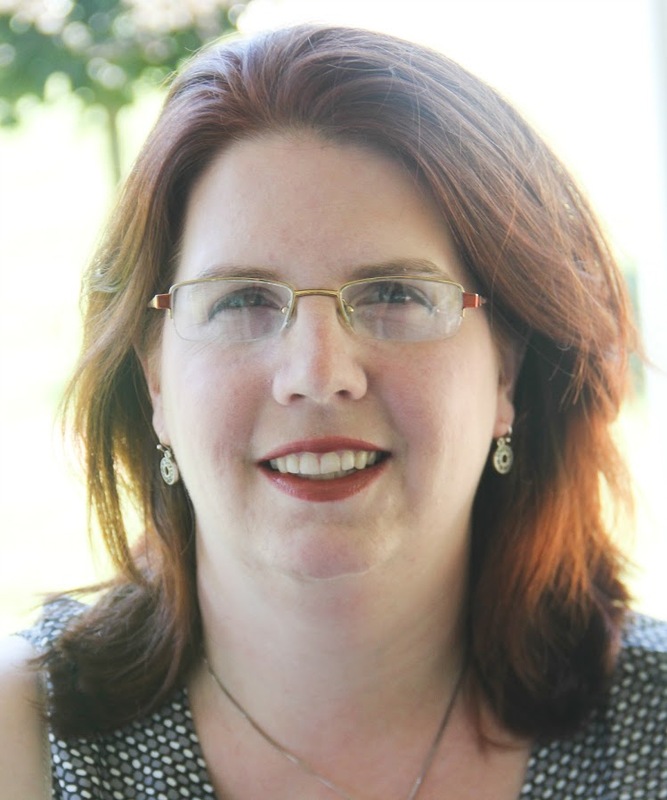 There are the obvious tips -- pick photos with good lighting, clear images, etc. But some of the most popular pins are very descriptive. Either catchy titles, or step-by-step pictures. The ones that catch my attention the most are a bit of both. For example, this is one my friend Cristi at Through the Calm and Through the Storm created. I've tried to make some pinnable images, but struggled to get text and coloring right. I use Picasa online to edit my photos, so I was trying to go with just that program. I was getting frustrated. It took me almost an hour and a half to create this image. It's pretty, but it's not as clean looking as Cristi's. So I asked her how she made hers. I was looking for an online editor, because I sometimes used different computers (it depends on where the pictures are). She told me she actually used two programs. 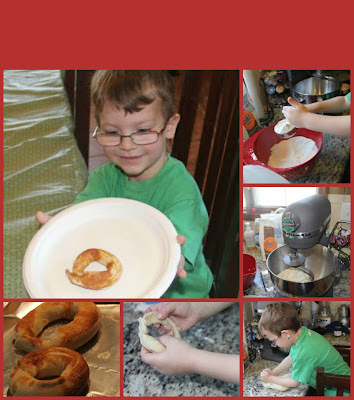 She's become a fan of PicMonkey to create the collages, and then adds the text in Picasa (since PicMonkey doesn't do text). Aha! So here's my first hybrid. Not bad, I think. 1. Look over the pictures you want to include, and chose the best one(s). Decide if you want just the finished product, or to tell a story. Edit them if you need to - crop out extra stuff, adjust color and lighting, etc. and save. 2. 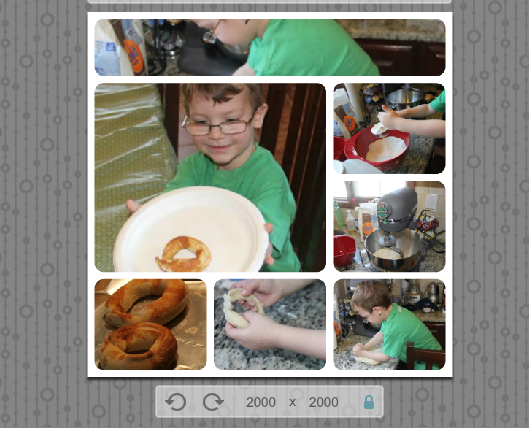 Go to www.picmonkey.com and choose "Create a collage." 3. Click on "Open Files" and choose your pictures. Load them to the clipboard. 4. Look at the far left margin. The second icon looks like a picture group. Click on that to open the collage options. Choose a collage style. For me, this is the hardest part. Having your pictures ahead of time helps. While you can edit the number of pictures in a collage, it makes a difference knowing if you want two or seven pictures. I chose "L-egant" for my layout. Note: The ones with a little crown icon require a paid subscription. I'm sure they're great. But honestly, with a little playing, the free ones are more than sufficient. 5. Click back on the icon that looks like a picture of the sun over a mountain to return to your photos. Drag the pictures into the collage. If you want it in a pre-formed spot, drag and drop into that square. If you want to add another picture in, drag it BETWEEN the squares. See the little arrows at the bottom? Use them to rotate your collage. For the pretzels one, I left it the way it generates. You can see in my "Make a collage" image, I rotated it so the smaller pictures were on the left instead of the right. and then click the little x in the upper right corner of the spot to delete it, leaving an empty space. If you like, click on the edges of the image to adjust the size of the entire image. If you click on the edges of the individual photos, you can adjust the size of those, too. Play around and see what strikes your eye! 7. Now, click on the artists palette icon. This will color in your background and allow you to adjust your border. 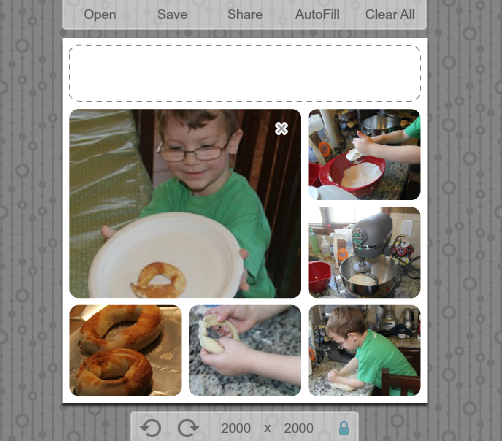 Adjust your pictures - do you want them with more space between, rounded vs. cornered edges, etc. 8. When you're happy with your image, save to your computer. Don't panic over the dotted line placeholder for the missing picture. That will not appear in your finished photo. 9. Upload your picture to Picasa Web Albums. This also is a (mostly) free online hosting service. I say "Mostly" because it depends on how much you have stored there. I blogged for about 6 months, using Google's Blogger service, before needing (and having to pay for) more space. You will need a (free) Google account to access it. 10. Edit your picture with Creative Kit, adding your text. You can also add any effects - adjusting lighting, temperature, etc. Save to your web albums. From there, you can either download the photo, or use the URL link to put it in your blog. 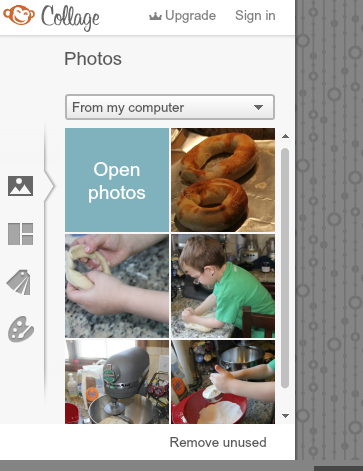 If you are just creating a photo journal of how to do something that doesn't need a blog post, you can pin the picture itself using the "Pin via URL" feature. Give it a try! I promise, it's not as hard as it seems. Once you've made a couple of them, the hard part is designing, not actually executing! M is for "Make a Pinterest Collage"
Oooh. I like the way you added a blank area for the text when you were still using picmonkey. 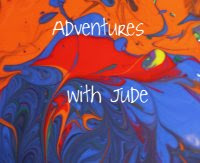 I just added large borders around everything and then cropped down three of the edges once I switched over to picasa. Is the edge blurring on your final collage a picmonkey feature? I haven't see it, but it looks like it's on the layer below the "Make a Pinnable Collage" title. Also, now that picasa and google+ have merged, I don't seem to have storage limits as long as I let google+ keep the smaller version (that's still perfectly usable for sharing on a blog). 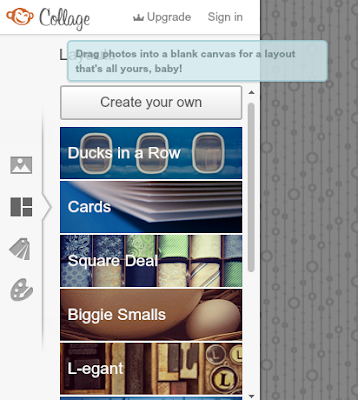 No, it's a Picasa thing. Under Effects, it's the Focal Black & White followed by Lomo-ish. I made the title my focal point so that stayed clear, and then where the edges fan between color and b&w in the body it hazes a little. 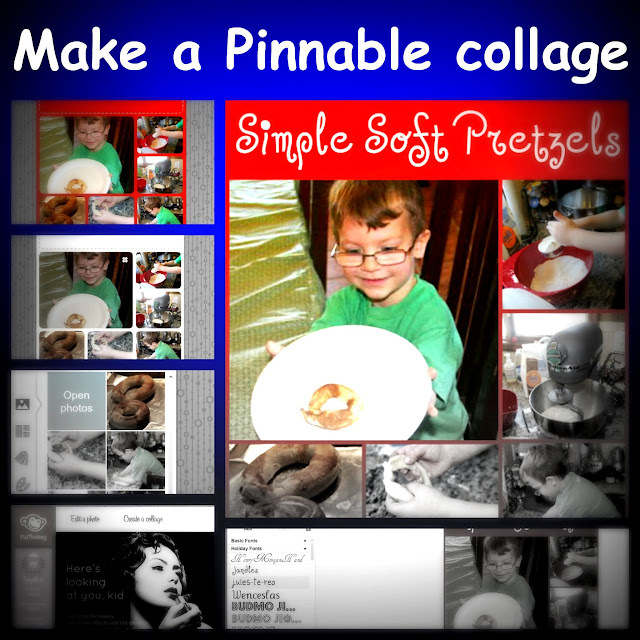 Normally I would not put that where I had text at the top (maybe in the center, when I want to highlight the center and haze the edges), but I wanted to highlight the "Make a Pinnable Collage" so that people didn't think they were getting a pretzel recipe when clicking. 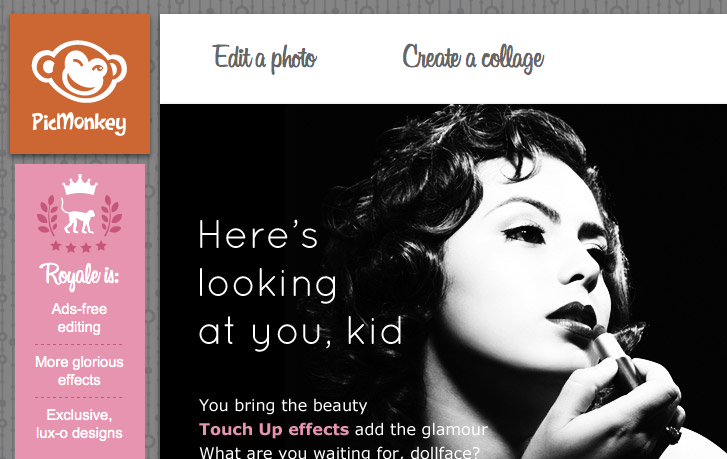 I have just found PicMonkey and love them!!! That was so helpful! Thanks for putting that into easy step by step instructions. It's something I have been wanting to learn, and I think you probably just saved me hours of "figuring it out" time! Thanks for the tutorial! I had the picmonkey part but not the second half figured out!, this was great help, Meg! You can use pic monkey for text. First you save your collage, then click on "Edit a Photo." The "P" in the list is for text. Awesome! Thanks for the hint! I already upload to Picasa (where I host blog photos), but for those not using it already, that's a great option I never figured out. Yes! I will be using this! Thank you!